Easy Holiday Look with Pieces you Already Own! ~ Roses and Rain Boots . Easy Holiday Look with Pieces you Already Own! All smiles this Monday morning because I finally finished all my Christmas shopping & wrapping. As a result, I am feeling SO relieved and accomplished. Continue reading for tips on creating an easy holiday look, with pieces you already own and how to enjoy the holidays- stress free. We all have our favorite pair of jeans and mine are my dark rinse Hudson Skinny jeans. These jeans are perfect for tucking into boots and always look presentable. Layering is an easy way to make an outfit look creative. Top if off with a festive scarf, under $15 and you've got an easy but festive look! 1. Shop small. Support your local businesses, and have guaranteed shipping since you pick it up in person & you'll beat the lines. 2. Buy- Wrap. As soon as I buy a gift, I prioritize my time to ensure I wrap it that night. This saves me from dreading that one day when it's time to wrap "all" the gifts. To help me stay organized I picked up a wrapping paper holder that takes up minimal room in our condo, but also keeps the wrapping materials we need easily accessible. 3. Make time for family, friends and holiday festivities! The holiday season is about spending time with the people you love, so leave extra time for that. Since we all know from the Grinch: "Maybe Christmas, he thought, doesn't come from a store, maybe Christmas perhaps... means a little more." 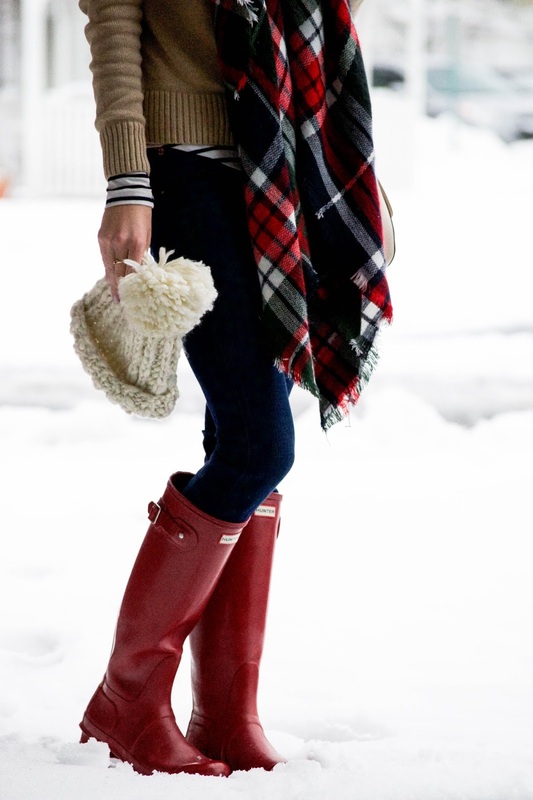 Love the red wellies and plaid together; such a nice Christmas-ey look ♥ And I've totally been doing the buy-wrap thing this season too!! I hate having a pile of shopping bags in the corner of the living room, and having everything wrapped makes me feel productive and festive!